I'll be in Barcelona from 9-13 July 2013. It's going to be another sketchwalk holiday — the best type of holiday! 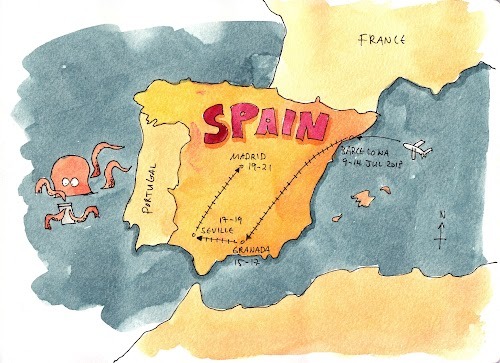 It happens that the Urban Sketchers Barcelona Symposium 2013 is also happening around that time from 11-13 July. There are going to be a lot of sketchers in the city during those three days. I'm not attending the symposium though. I'll just be sketching around Barcelona and then joining my sketch buddies for an extended trip to Madrid after that weekend. I know there are many Gaudi buildings there. I wonder if I can visit them all. I'm so inspired after seeing Nina Johansson's sketchbook Drawing Around Sagrada Familia, and all the watercolour travel sketchbooks by Fabrice Moireau. What should I look out for? Or what should I not miss when I'm there? If you guys want to hang out and sketch, I'm all for it too. This is terribly exciting! First time in Europe!